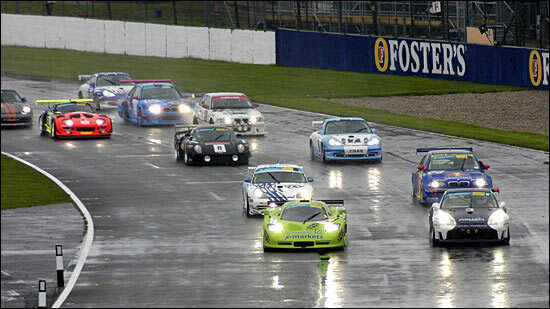 The colour scheme of the header on this page may be wrong – the Rollcentre / Balfe Motorsport entry was the original Rollcentre Mosler, not the Balfe FIA GT car (although it was prepared by Balfe Motorsport) – but that’s almost the only thing that was wrong about this combined team’s effort at the inaugural Britcar 24 Hours. 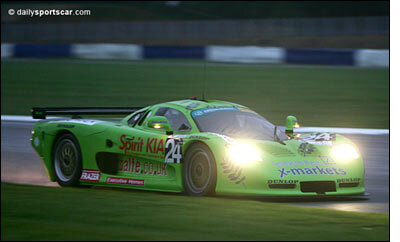 The Mosler stood out from the rest of the entry, and not just because of its colour scheme. A field of over 50 GTs and ‘touring cars’ included plenty of variety – but the Mosler was one of the few ‘beasts’ on the entry. We could add the two ASM Ford Falcons, but they arrived at the track (one almost direct from Australia) as very effective sprint cars… the Mosler is an endurance GT car. 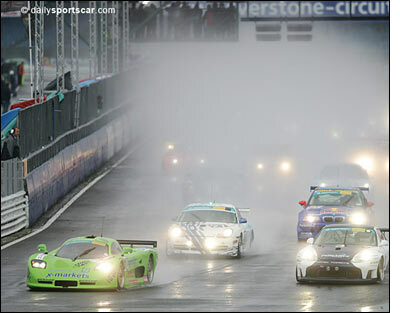 The main opposition would some from a group of four Porsches (and perhaps one BMW), but if the ‘Germans’ were waiting for the Mosler to meet problems, they’d have a very long wait. It was the German cars that would all face delays of one sort or another. The refuelling method for the 24 Hours actually favoured the slightly more fuel-efficient (and larger fuel-celled) 911 GT3 Cup Porsches. A typical stop for fuel took over three and a half minutes, or nearly two laps, so the Mosler was going to have to have a fast, incident-free race if Shaun Balfe, Martin Short, Jamie Derbyshire and Nick Jacobs were going to come away with the overall honours. And that’s exactly what the Spirit-Kia / VW, Balfe Executive Homes and x-markets Deutsche Bank backed team produced – an almost perfect run. The team even managed to miss the opening practice session – along with several others, all fighting to get their cars below the unusually low maximum decibel reading required. Shaun Balfe therefore set off to qualify the Mosler on Friday afternoon without a lap behind him – and set the pole position time. So the (almost) perfect start to the event – but then it rained. Friday evening’s ‘night’ qualifying session (each driver had to complete three laps in darkness) came to a shuddering halt… as did Shaun Balfe, out on the track. The car didn’t expire though: Shaun stopped because the conditions were so bad. It wasn’t as wet as that for the start, later on Saturday afternoon, but it was still horribly wet. Martin Short was the man with the responsibility of getting the Mosler’s race underway, and after a brief flirtation with the Porsches, he left them to it, an followed at a respectable distance. Short and then Balfe took up the challenge through the night (this is an earlier stop, right, Balfe to Derbyshire). 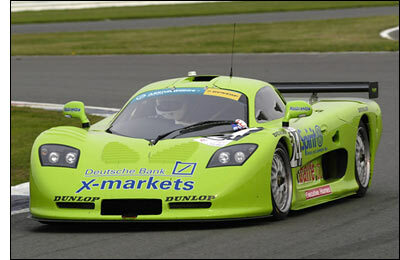 From fourth in the early evening, the green Mosler moved up to second at midnight, and then into the lead when the Parr Motorsport Porsche had its first confrontation with a backmarker. Two new water radiators were required, and the Porsche dropped to seventh. The Cirtek Porsche had been delayed with front wishbone problems, and then later on two more unscheduled stops for steering rack attention, so the main challenge, for now, came from a 911 GT3 Porsche, entered by Chad Racing. Nigel Greensall, Iain Dockerill and F3 man Steven Kane drove this one, and very effective challengers they were too. 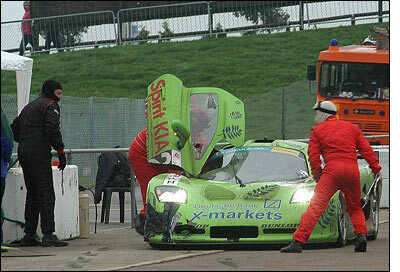 The nearest the Mosler came to drama was when Shaun Balfe took over from Martin Short in the night, ran his first stint on wets, pitted for fuel and slicks, then emerged to find a safety car period. Balfe was back in at dawn, and proceeded to set the fastest lap of the whole race. “I was able to get into a rhythm a lot quicker and I set a handful of pretty quick laps and keep up the pressure on the chasing cars,” was how he described that period of the race. But all the time, with its longer stints between extended fuel stops, the Parr Porsche was closing. That brings the story to 11 am on Sunday morning, with six hours still to go. The Mosler was two laps ahead of Chad’s Porsche, which was on the same lap as Kelvin Burt in the Parr 911. And that’s exactly what happened. 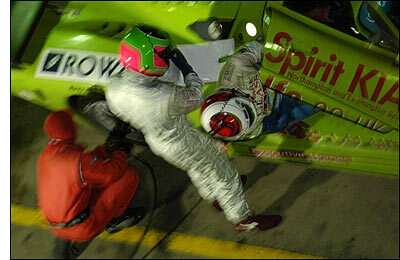 Burt was ‘chopped’ by a lapped car, and pitted for another radiator. That was that car out of the way, even though Burt and Franchitti were a very impressive pair in #27: they were just too far back though. Jamie Derbyshire, still not well, completed a fine double stint after midday, leaving Shaun Balfe to complete the race. It wasn’t over ‘til it was over though. One hiccup from the MT900R and the Chad Racing Porsche would have clawed back the lap and a bit that separated the two cars. 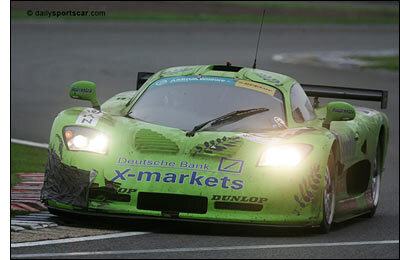 But the Mosler strategy had worked out perfectly: Shaun Balfe could run a full stint to the flag. “We were effectively one fuel stop from losing it,” said Martin Short. “Had we needed another stop…. it was quite remarkable that it all came down to just a lap between the first two at the end." 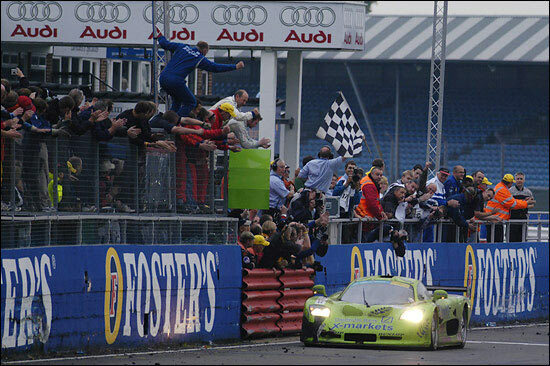 The whole Balfe / Rollcentre team lined the pit-wall to cheer Shaun Balfe across the line at 5 pm on an overcast Sunday afternoon - for the first ever 24-hour race win at Silverstone and the first overall 24 hour win for a Mosler (one of which had won its class at Daytona). “Martin put in some blistering laps to see what sort of fight the chasing Porsche had left before he handed the car over at the end,” said a very tired Shaun Balfe. “It really is hard to describe what this means to us as a team and myself as a driver." No one really knew what to expect from the first running of the Britcar 24 Hours – but the Mosler team, and the Porsches from Cirtek, Chad and Parr, combined to create a thrilling race – as intense as a 24 hour race can be, with all the top cars being driven very hard throughout. The Mosler had behaved (almost) impeccably: there was just a slight concern over a fuel pressure warning light, plus a little bit of brake pad knock-off. What a 24 hour car the Mosler has become, thanks to the attentions of Martin Short and Shaun Balfe, and their respective teams. 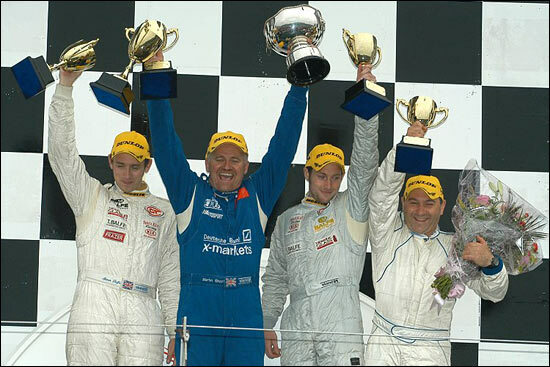 These two were once great rivals, but when they apply themselves together.... you get a result like this, overall victory, in the Willhire Britcar 24 Hours 2005 – the first one, hopefully of many.